I’m so proud of this group that fellow mortgage Broker Sabeena Bubber has created. Over a year ago I was asked to join a group of Canadian Mortgage Brokers looking to make an impact in people’s lives past mortgage financing solutions. 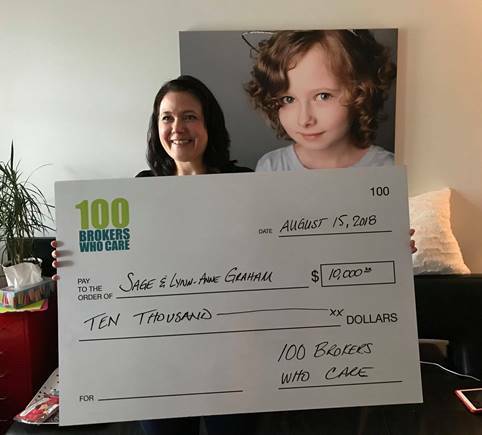 100 Brokers Who Care is a group of Mortgage Brokers who all financially donate to 4 amazing causes per year. We collectively submit nominations for the next donation, and we all vote on the final decision. Last month, a cheque was handed over to Sage and Lynne-Anne Graham. Sage is a courageous 7-year old that has endured more in the last three years than anyone should in a lifetime. When she was four, Sage was diagnosed with stage 3, FH Wilms Kidney Cancer. It took over one of her kidneys, grew up her IVC (main artery) and was inside her heart. Sage has had multiple life threatening surgeries, including open heart surgery, radiation, proton therapy, chemo and much more. She is undergoing her third round of chemo as another spot has been found. She is such a brave, beautiful, strong girl that still maintains a positive outlook on life regardless of the hard knocks she has been given. Lynn-Anne is her superhero Mom. She is a single parent who has been with Sage every step of the way through this journey. Lynn-Anne is an advocate for Childhood Cancer. She has not been able to work because of the time and care needed for Sage, spending weeks at a time in the hospital. Income has been tight lately, but the $10,000 donation from 100Brokers will help Lynn-Anne buy new car tires, pay for every day bills, or simply taking Sage out for a dinner as a treat.